Pulled pork is the perfect Sunday comfort food. This recipe is my husband’s and I love that he adds fresh cilantro. You can use any fresh herbs you have on-hand. The pork absorbs the flavors as it slow cooks throughout the day. Your home will smell amazing and your mouth will water while you anxiously wait to dive-in. Any good pulled pork sandwich is typically served on a fresh potato bun. I will not lie, it’s my favorite. But, I also don’t like to eat a ton of processed white bread so I swap out my bun for a romaine lettuce leaf. 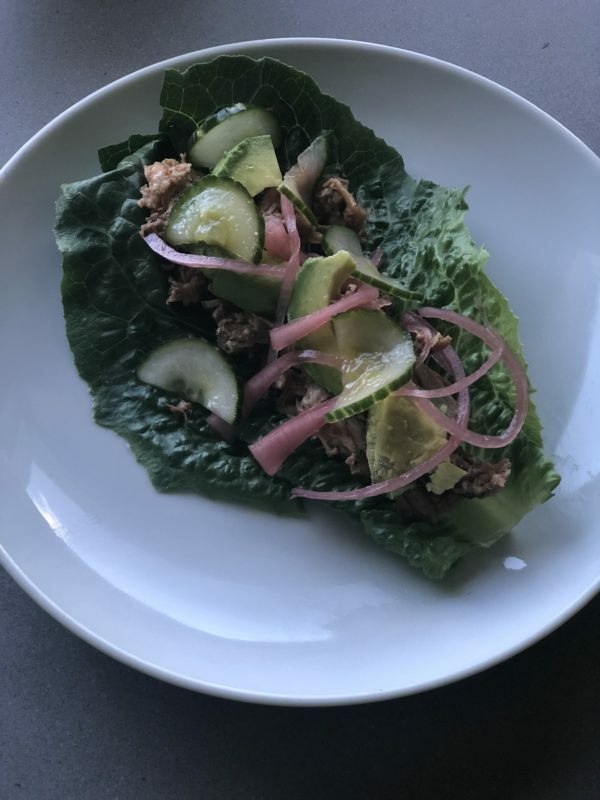 Bibb lettuce is another hearty lettuce leaf you can use or try rolling it up as collard green wrap. 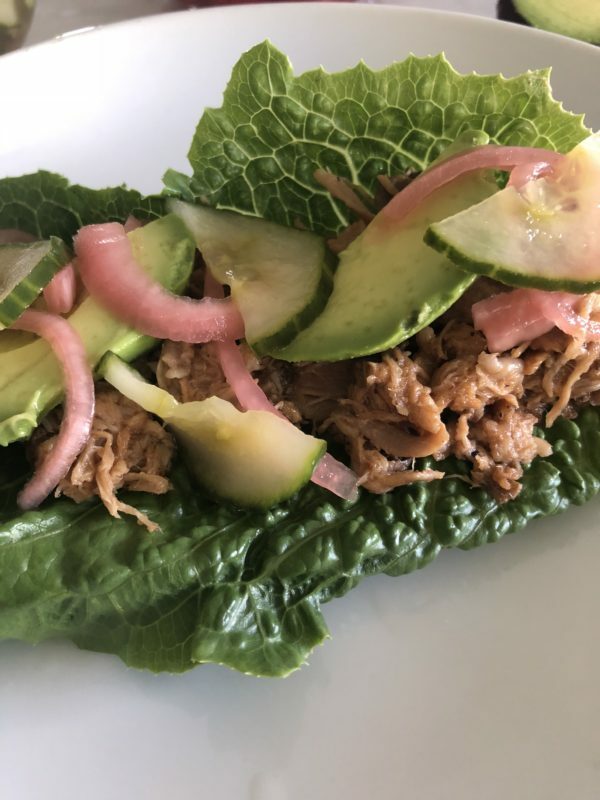 I am a huge fan of pickled red onions on any pork dish but recently I discovered pickled cucumbers. Oh my, it’s so good. I have to admit, I was completely intimated to make pickled anything…it sounds so time consuming. But, much to my surprise, it is super simple and takes hardly any time at all! Click here to grab my recipe. Here you have it. My perfect lazy Sunday comfort food…with a healthy twist. Give it a try and let me know what you think. A new spin on an old classic. 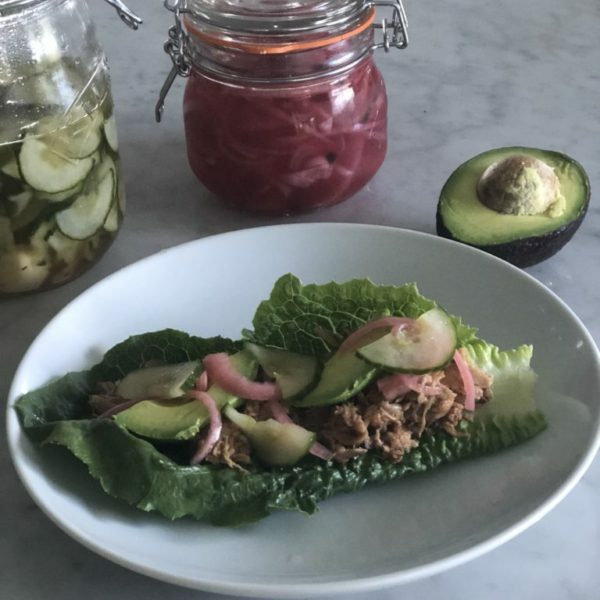 Skip the bun and use a crisp romaine lettuce leaf for this delicious pulled pork sandwich. Crisp pickled cucumbers provide a tang and a touch of sweetness. Avocado add a delicious creaminess to pull all the flavors together. The perfect lazy Sunday meal. Trim off any large pieces of fat. Drizzle with olive oil and sprinkle with salt and pepper. 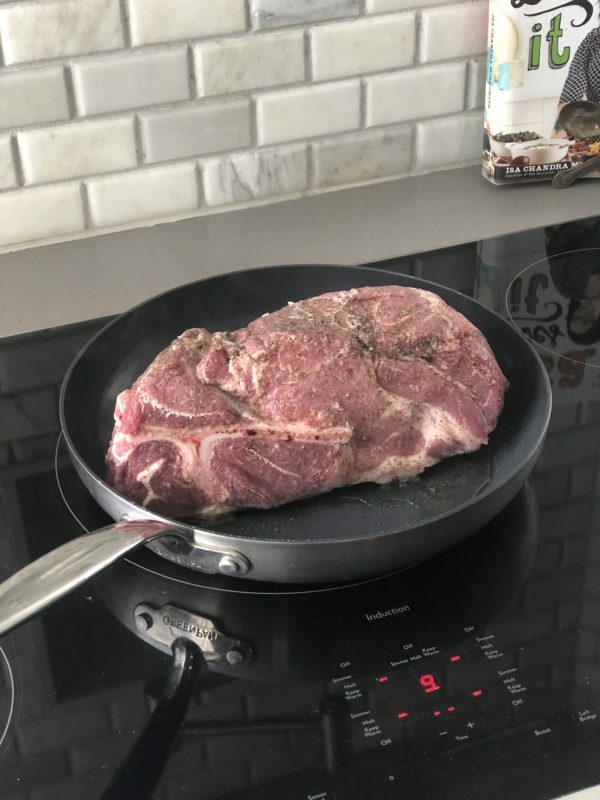 Place in a skillet on medium heat. Sear pork for about 2-3 minutes on each side. Place the seared pork in a slow cooker. Pour in chicken stock and add onions and peppers around the pork. Add chopped cilantro (or any fresh herbs of your choice). Cook on LOW for 10-12 hours. You can cook on HIGH for 8 hours. Transfer pork to a cutting board to cool. Using your hands or two forks, shred pork into bite-sized pieces. Discard the bone and any large pieces of fat. Reserve a little of the broth. Combine shredded pork with barbecue sauce. You can add a little of the reserved liquid to coat pork evenly with the sauce. Arrange romaine lettuce leaves on a serving dish. Scoop shredded pork and add your favorite toppings. I like pickled cucumbers, avocado, and red onion. Sliced avocados are a must!